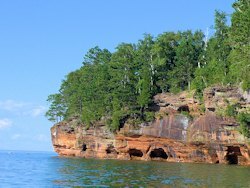 Wisconsin's Madeline Island, the most southern island of the Apostle Islands, may have been visited as early as 1618 by Etienne Brule - preceeding the Pilgrams landing at Plymouth Rock by 2 years. By 1660 active trading by Radisson & Groseilliers is a matter of record. During the 1660s Jesuit priests Menard, Allouez, and Marquette visited the area in their attempt to bring Christianity to natives. In 1693 Pierre Le Sueur founded a trading post on the south end of the island. 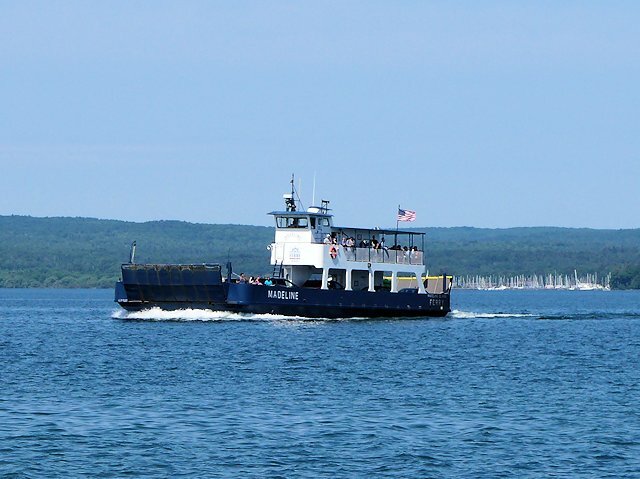 The Madeline Island Ferry has resumed service to the island April 1, 2019. 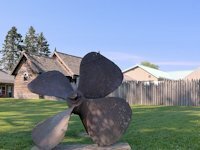 Things to do and see on the island include a walking tour of the historical structures in LaPointe, visiting the history museum, sampling the restaurants and pubs, taking a bike, bus or car tour of the island, beach combing, golfing, hiking, swimming or camping at Big Bay State park, and just "hanging out" enjoying the easy ambience of the island. And the ferry ride itself is a worthwhile attraction - you get a view of the Apostle Islands and Bayfield from the water that you can't get from land. On one visit in mid-May, we took the Madeline Island Ferry to the village of LaPointe, WI on Madeline Island. For early season and a forecast for a cool, rainy weekend, we surprised to see the number of people and cars headed for the Island on a Friday afternoon. The Ferry had to run an extra trip to meet the demand. Another year we arrived Memorial Day weekend and have also visited the Island in mid-summer to spend some time at Big Bay State Park. We've also been there in the winter crossing over from Bayfield on the madeline island ice road. 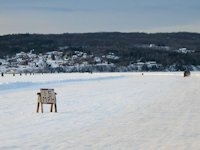 Before the ice is thick enough to run the ice road, people can visit Madeline Island in the winter by using the Madeline Windsled Taxi, which runs on top of the ice but is also a boat which will float should the ice not be thick enough. One of these days it would be fun to take it. 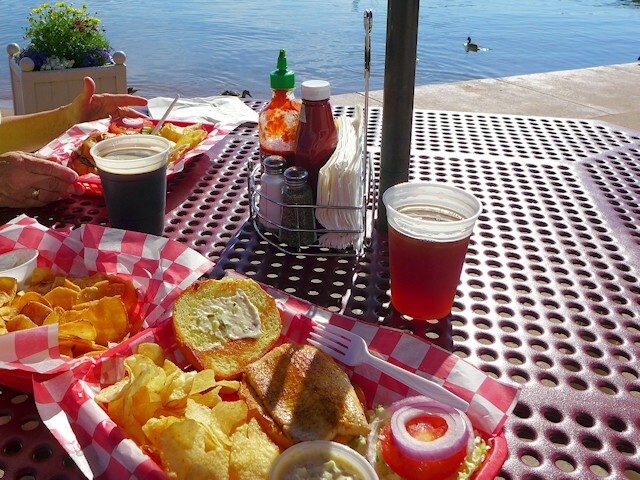 Grandpa Tony's is a favorite for ice cream and pizza, but they also have sandwiches and beer, plus a great upper deck with a view of of the lake. Across the street from Tony's is the The Beach Club on the waterfront as the name suggests. We dined there two times during our recent trip. 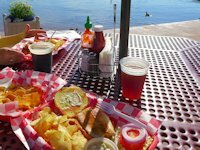 On our first visit we tried two dining specialties we often use as a benchmark for Lake Superior dining places: Whitefish Sandwich and a Swiss & Mushroom Burger baskets (with chips and cole slaw). Both dishes got good marks. The Whitefish was flakey and not "fishy" tasting, grilled just right, and served hot on a sourdough bun. The burger was also served hot as well, meaty & tasty, and a good portion size. Wait service was quick and attentive. Friendly bartender served up pints of South Shore Brewery's Oatmeal Porter and Nut Brown Ale. The next day Friday, we sampled the Beach Club's Friday Fish Fry and enjoyed the lakeside deck. Your choices were either Lake Superior Lake Trout or Whitefish, lightly breaded. Came with large serving of fries and cole slaw. As the previous day, the Whitefish was excellent, tasty and served hot. The Beach Club also gets high marks for value. You'd expect prices on the Island to be higher than average. This was not the case at the Beach Club. 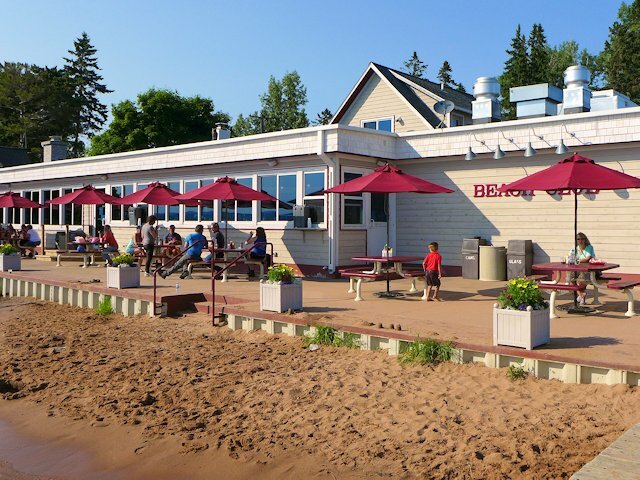 The Whitefish Fish Fry was $11.50 and 16 ounce tap of craft beer was $4.50, no more than the average you'd find around Lake Superior (prices from 2015). Reviews online from Google Plus, Yelp, and TripAdvisor agree with our favorable assessment. 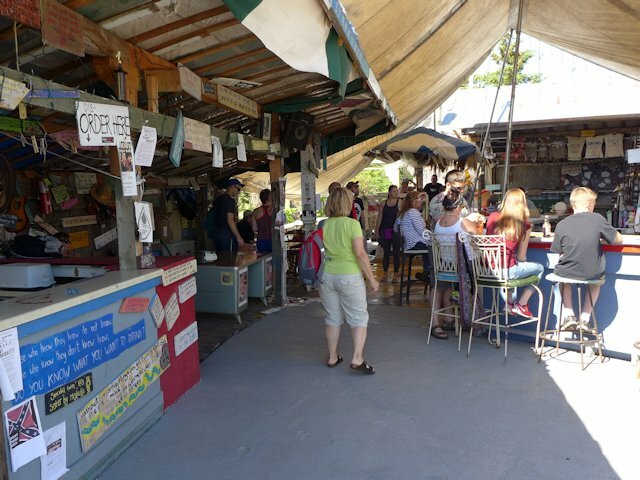 Not to be missed for the island visitor is stop for a cold beverage, at decent prices too, is Tom's Burned Down Cafe. 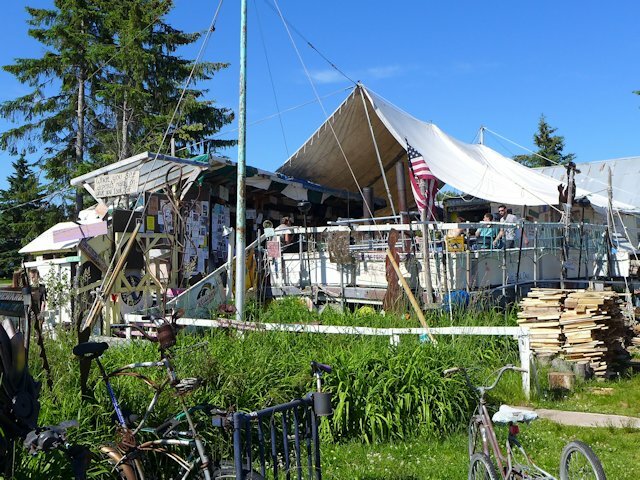 A crazy, outdoor mish-mash of old trailers, tents, all sorts of junk, pieces of lumber thrown together to create a unique and fun "beach dive bar" that belongs on the waterfront but happens to be a block away. Besides the crazy pieces of junk forming the habitat and landscaping, Tom's is also littered with pithy wit and wisdom decorating the place. 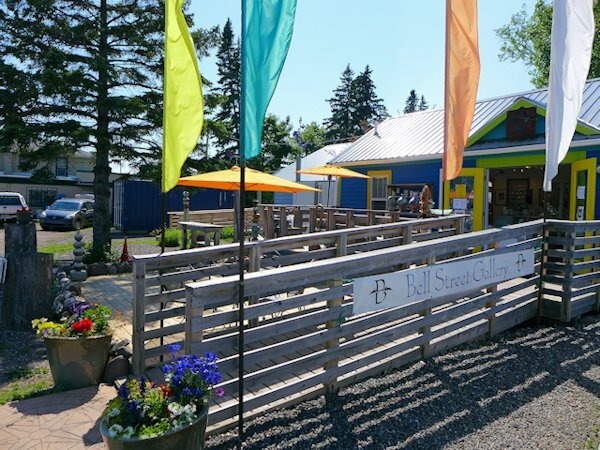 The Bell Street Gallery provides an interesting blend of an artist gallery, a wine and craft beer bar, and a musical entertainment venue. More Madeline Island Restaurant Reviews & Links & Things to see and do. < < < While it was a gray, overcast day, these flowers in front of this downtown house brightened up our arrival. < < < The Library, originally Bay View School, dates back to 1872. Most visitors to the island take the ferry from Bayfield as passengers or with their vehicles. On a nice day, you can enjoy panoramic views from the ships upper deck. The SUV left of center is first in line for the next Madeline Island Ferry trip. The parked cars are those of people who are riding the ferry over without their vehicles. While taking your car or RV to the island is a neat experience, you can see quite a lot by walking around town. If you want to go further around the island, you can rent a bike. "ARVY" - our Winnebago Rialta - enjoyed a smooth ride across the 2.6 mile stretch of Lake Superior from Bayfield to LaPointe. We were half-way across before I realized we had left the dock! As soon as the ice is out, the Madeline Island Ferry begins running 4 times a day from Bayfield to the village of La Pointe. After May 7th, its schedule increases to 11 daily trips, in June and July even more frequent. The island Windsled provides service to the island when the bay freezes over. In 2009 we visited the campground in August mid-week. With no advance reservation we were out of luck for staying overnight but we were able to enjoy the park for a few hours. On a later visit we lucked out and nabbed a walk-in site. But we'd recommend reservations because this is a popular park. 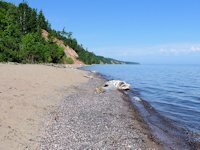 (See our profile on Madeline Island's Big Bay State Park). Update: Just learned the the Big Bay Township Park has made a number of improvements, including adding RV sites with electric hookups, flush toilets, showers, and other improvements. We stayed there in June, 2015. What an improvement! 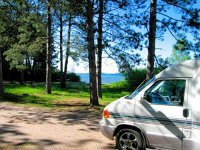 See our profile of Madeline Island Big Bay Township Campground here. 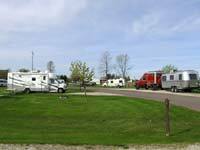 If you plan to camp on the mainland, check out our recommendations on Bayfield Area Camping. 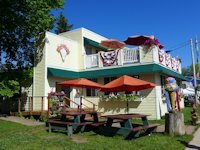 The Madeline Island Chamber of Commerce website outlines a number of visitor attractions. Click Here for a pdf file of the Chamber Madeline Island Map. 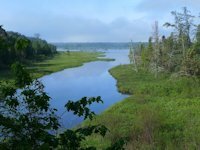 Madeline Island Wilderness Preserve - hiking, skiing, berry-picking, etc. Big Bay State Park - a popular spot for camping, swimming, boating and hiking. 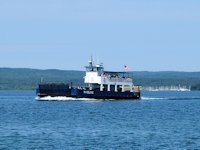 Madeline Island Ferry - runs several trips per day between Bayfield and Madeline Island. 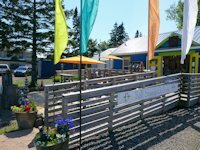 More things to see and do on Madeline Island. Tips on things to see and do in Bayfield, WI. 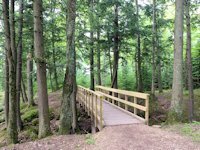 Madeline Island Town Park Campground has been significantly upgraded. 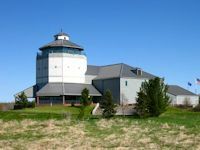 Ashland's Northern Great Lakes Visitor Center is a must-see stop for visitors to the Ashland-Bayfield area. 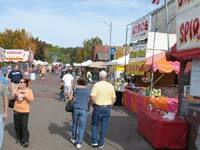 Bayfield Apple Festival is Northern Wisconsin's favorite fall festival.